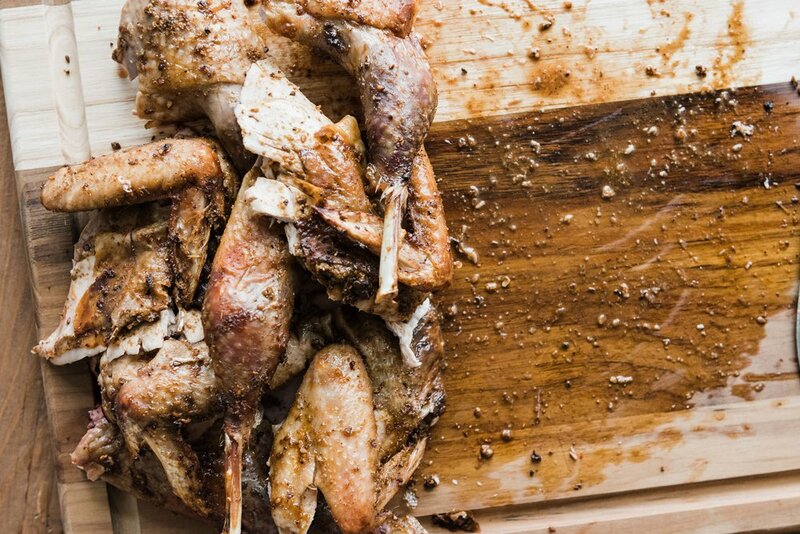 Today I’m sharing my Za’atar and Aleppo pepper roast chicken. I love a good roast chicken. I’ve been attempting different recipes for years, and I finally found my go-to. I’ve tried everything from Mark Bittman’s roast chicken, some Bon Appetit recipes. The one that works for me time after time is the recipe from America’s Test Kitchen. With the ATK recipe, you separate the skin from the breast and from the legs and rub butter all over the meat. It’s then smothered in olive oil and roasted in a v-rack. I don’t have a v-rack, so I place the chicken on top of a roasting rack and roast it on it’s side. I use bundled up foil to keep it in place. I make a seasoning rub of za’atar, Aleppo pepper, cumin, lemon juice and salt and pepper and smother it all over the outside and inside the skin. If you can marinate it overnight it’s even better, but even if you don’t, it’s still juicy and delicious. Serve this chicken next to roasted potatoes, roasted carrots, a zesty salad, etc. You can also shred the leftover meat (if you have them) to put in salads the next day, but don’t count on it. This chicken is going to be devoured. If you give it the recipe a try, don’t forget to put it in the comments and tag @omayahatassi and #omayacooks on Instagram. Prepare a baking sheet by lining it with foil and place a roasting rack on top. Alternatively, use a v-rack. Separate the chicken breast and legs from the skin. Rub the butter all over the meat. Cover with olive oil. Combine the remaining ingredients in a small mixing bowl. Smother the inside and outside of the meat with the seasoning. You can let the chicken rest overnight at this point. Place the chicken on the roasting rack on its side, stabilizing with balls of foil. Roast until an instant-read thermometer reads 165 F when inserted in the thickest part of the breast, about 45 minutes, flipping halfway through. Rest for 10-15 minutes before serving.